This walk is not too difficult, but it is quite long, taking us about 5 hours in total (with a sandwich stop for lunch!). It is approx 10.5km long with about 500m of ascent and descent. Map IGN 1:25000 Banyuls/Col de Perthus/Cote Vermeille (GPS) 2549OT. 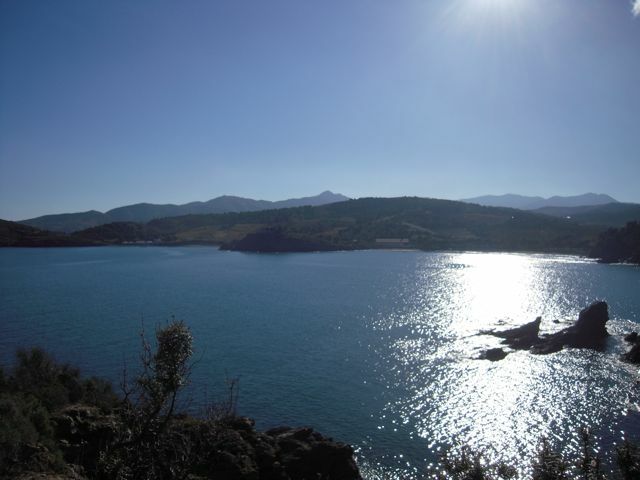 Start at Redoute Béar in Port- Vendres and follow the coast westward. There is a well- marked ‘sentier littoral’ which climbs quite steeply up from 509830E 4707600N, crossing the coast road and tracking parallel to it along the hill below the military base at Fort Béar. If you look back, you can see the docks in Port-Vendres where the fishermen sell their catches, and beyond that Fort St Elme overlooking Collioure and built to protect the town from Spanish invasion. The dramatic scenery with azure seas and waves crashing on to the steep rocky coast can only be described as breathtaking. After about 2 km, having climbed 120 meters or so, you start to descend towards the 1905 Phare de Béar, the last lighthouse before Spain. 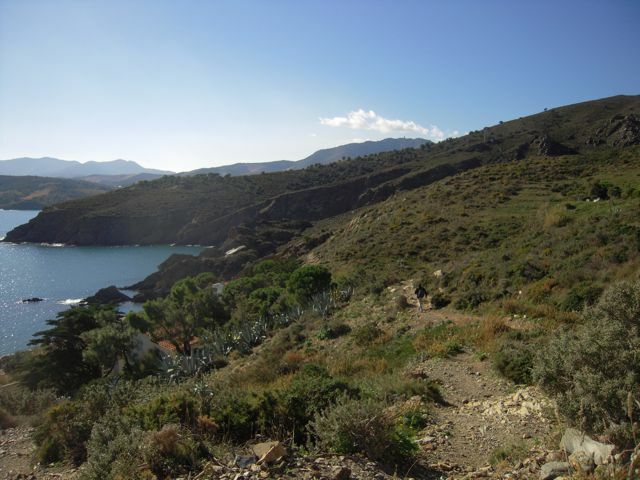 The path joins the road to the lighthouse, and so you can concentrate on admiring the view to the south towards Banyuls. The vegetation along the roadside consists of many prickly pears (which, true to their name, can leave you prickled for hours – I talk from experience!) and spectacularly tall Agave Americana or ‘Century plants’. If you take a detour to the headland below the rather incongruous-looking Phare, there are ruined German gun emplacements and bunkers abandoned in 1944, overlooking the inhospitable rocky shore. After leaving the headland, climb back up to the cliff-top path and follow it south and west, perhaps stopping for a paddle and a sandwich at one of the beautiful secluded coves on the way. Continuing along the path brings you eventually to the lovely beaches at Paulilles. If so inclined, you can visit the remains of the first nitro-glycerine factory in France. In season there is also a diving school to help you take advantage of the crystal clear water. From the beach head inland, crossing the N114 and following the small road to Cosprons over the railway line. After about 500 meters at 509420E 4705350N a footpath crosses the road. Turn right onto the path through the vines, and follow it north-east, taking care not to stray left and end up in a dry river bed as we did! After 100m the path turns right and follows the contours of the hill down to a small gully, before turning left again at the foot of a terraced hill shown on the map as Puig de les Cabreres. The path then climbs towards a minor road, and you should emerge from the vines at 509320E 4705970N, next to an agricultural well. From here the path leads up the hill northwards, and is signposted Col Del Mig. 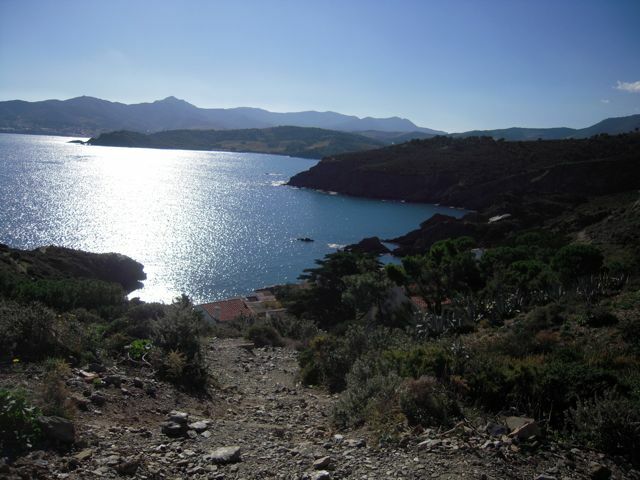 After about 500m you reach the crest of the hill overlooking Port Vendres. The path picks its way down behind some villas just being built. 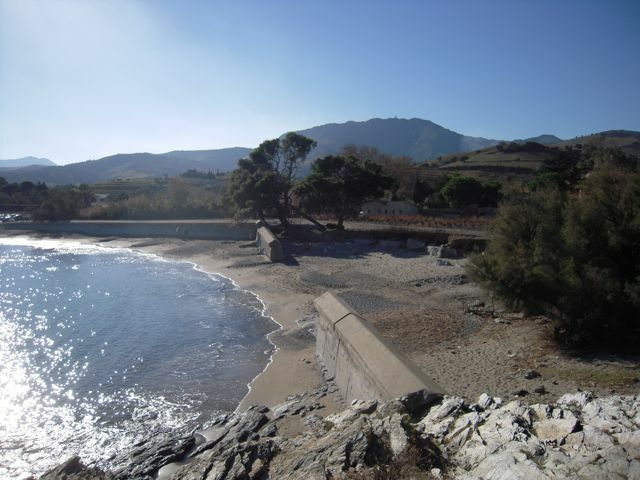 On the map it continues to the bottom until it reaches the main road into Port Vendres, which is true, but also involves entering a concrete drainage channel parallel to the road! From the main road, turn left over the railway bridge, and follow the road (caution, it’s narrow and has no pavement) down into town, turning right to circle the football stadium and then again around the fruit port area until you finally return to your starting point at Redoute Béar. Congratulate yourself on your achievement, and then head home to reward yourself with a cold beer or glass of Sangria!